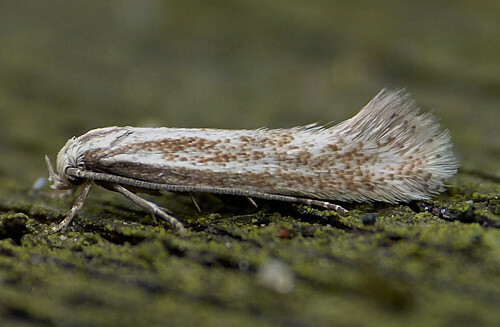 Elachista rufocinera (photographed by Doug Fairweather) on May 7th at Tophill Low NR, East Yorkshire became the 614th moth species to be found on site since recording properly began in 1992. 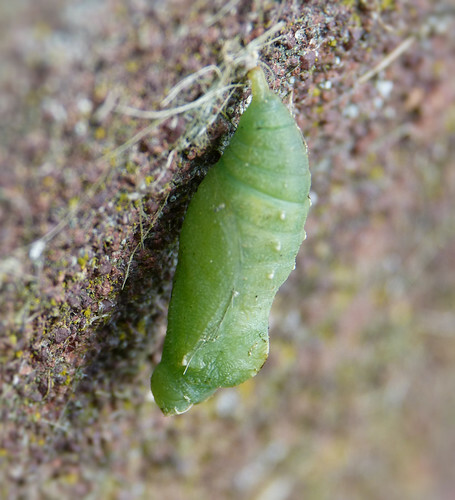 First discovered in Yorkshire in 1883, it remains something of a scarcity with just 123 records (per Yorks moths). The VC61 records come predominantly from the coast, Spurn in particular, but the species is possibly under-recorded given its small size. 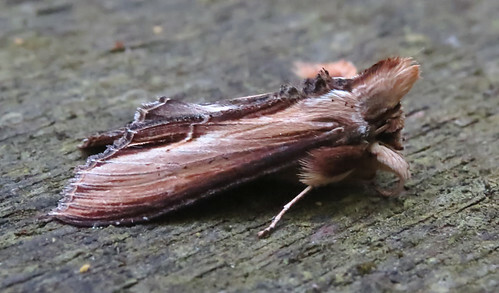 Despite the cold spring weather, trapping has continued with small numbers of moths recorded of the commoner spring species. 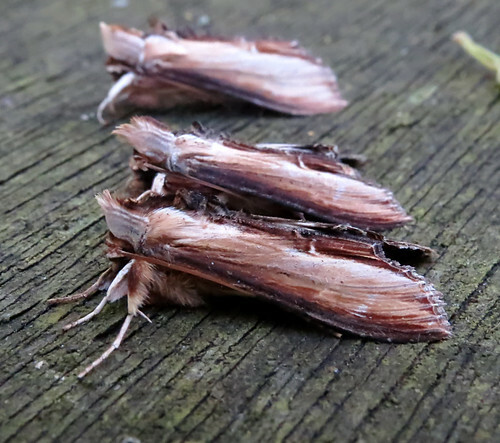 However, the only Mullein Cucullia verbasci ever recorded at Tophill appeared in 2001 – so it was something of a surprise 15 years on to find three individuals in one trap – the 2nd, 3rd and 4th records posed below. 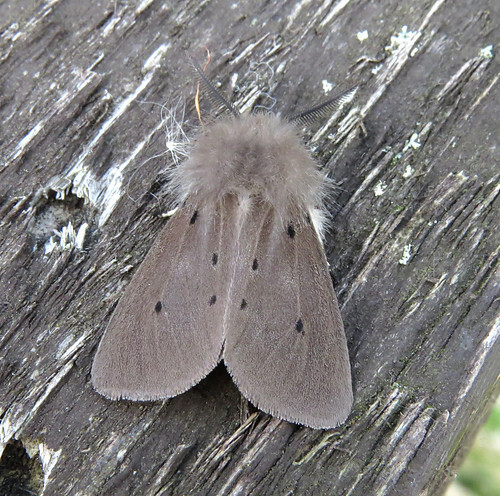 The odd Muslin Moth Diaphora mendica is an indication that the mothing season is changing from the early spring fare, while two Streamer Anticlea derivata trapped overnight on May 8th were the first site records since 2013. The welcome warmth felt during the first week of May saw an increase in butterfly diversity with Large White Pieris brassicae, Small White P. rapae, Green-veined White P. napi, Orange Tip Anthocharis cardamines, Brimstone Gonepteryx rhamni, Red Admiral Vanessa atalanta, Peacock Aglais io and Speckled Wood Pararge aegeria showing in small number – the Speckled Wood P. aegeria pupa above photographed by Doug Fairweather no doubt soon to emerge. 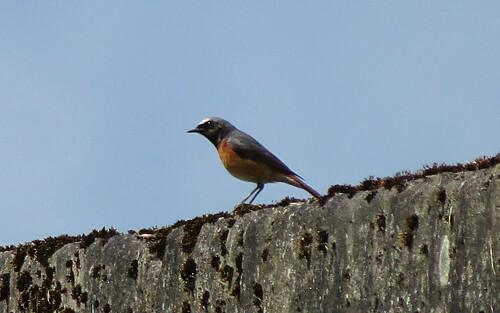 The final week of April proved almost bird less with the cold weather, but the change of weather pattern overnight on April 29th saw this Redstart Phoenicurus phoenicurus appear on the 30th. The second of the spring, the bird showed well around East Scrub, often perching up on O reservoir wall as it fed up before its departure north. This Ruff Philomachus pugnax was present on May 8th, while three Ringed Plover Charadrius hiaticula dropped in on the same date. 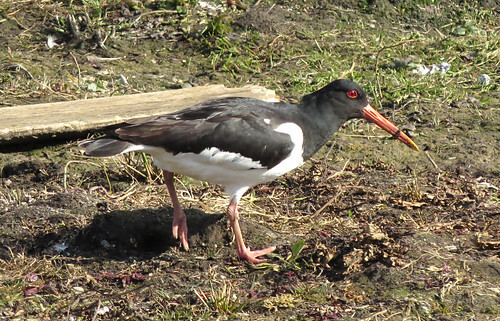 Oystercatchers Haematopus ostralegus, Little Ringed Plover C. dubius and Lapwing Vanellus vanellus remain on site – but how successful will the breeding season be? 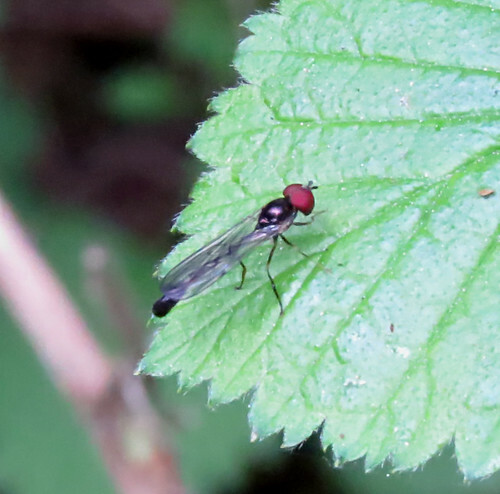 As ever, for the latest round up of news from Tophill Low click here on the Yorkshire Water Blog. The Yorkshire Odonata season kicked off on April 22nd, with the first on the wing at Tophill Low a day later, but very little happened thereafter due to the cold weather. 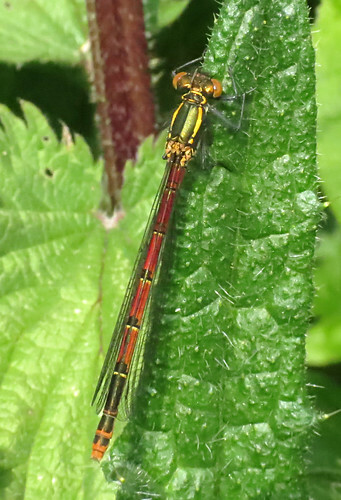 However, Large Red Damselfly Pyrrhosoma nymphula can be recorded easily in three figures now, while Azure Damselfly Coenagrion puella are out in incredibly small numbers for the time of year. 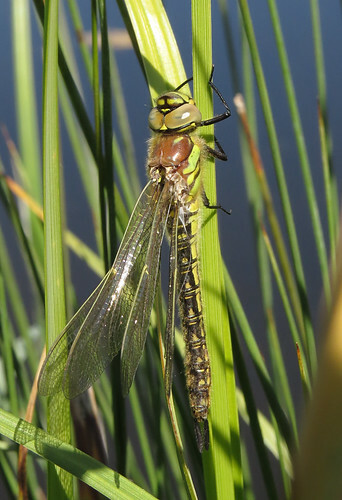 The first Hairy Dragonfly Brachyton pratense on the wing in Yorkshire was photographed during the monthly guided walk led by Richard Hampshire on May 7th – a nice stunning mature male on investigating the photographs. 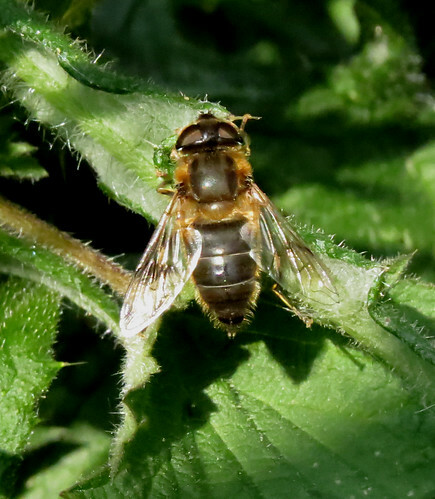 Hairy is a relatively new species to Tophill – indeed it was considered almost extinct in Yorkshire at the turn of the millennium by almost everyone. To quote the Dragonflies of South-east Yorkshire atlas written and compiled by Paul Ashton, ‘the first vice-county record was in a Beverley garden in 2007. 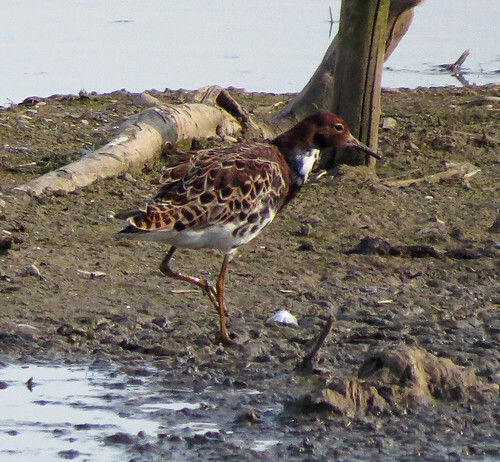 Confirmed as present at Broomfleet Washlands in 2008, subsequently in the wider Broomfleet area during 2009. It had been suspected as present at Tophill Low with some brief, but inconclusive, views over a number of years. 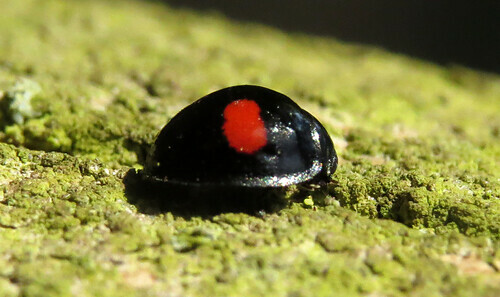 It was finally confirmed in 2009, when several were seen, including an ovipositing female’. 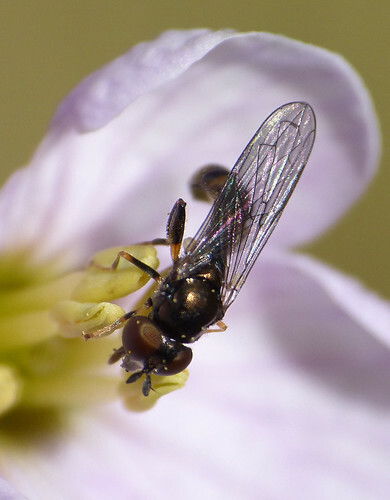 Those brief, but inconclusive views precede 2007, and ovipositing females since 2009 haven’t been the easiest of things to find – the majority of individuals recorded have been males. 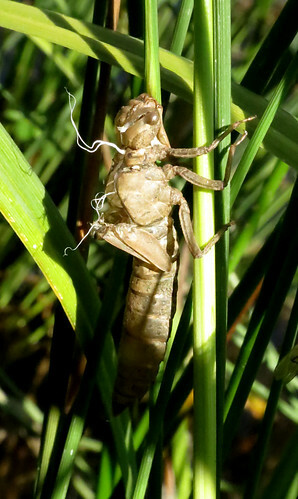 However, with larval development taking two years, it pays to remember where you saw ovipositing females, and finally, seven years later on May 9th – the species was finally proven to breed with the finding of a pre-flight teneral and the exuvia, thus becoming the 16th species of odonata recorded as breeding on site. 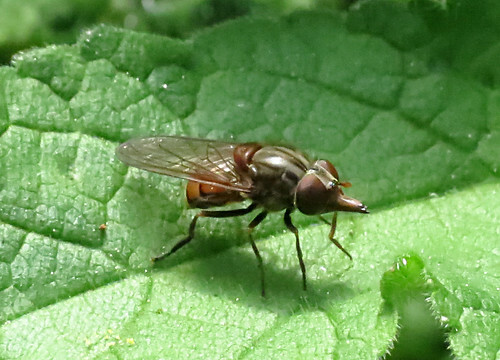 Neoascia tenur found and photographed in late April by Doug Fairweather became the latest addition to the site Hoverfly list. 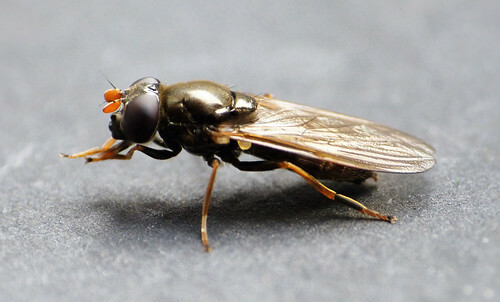 A good diversity of species are on the wing now including Cheilosia pagana, Baccha elongata, Rhingia campestris, Leucozona lucorum, Eristalis tenax and many others. 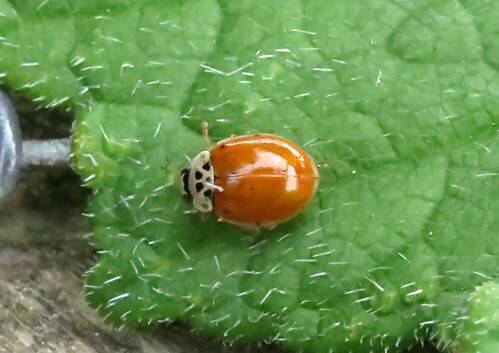 Coccinellidae Ladybirds are very much in evidence, Kidney-spot Ladybird Chilocorus renipustulatus in particular shows well at this time of year. 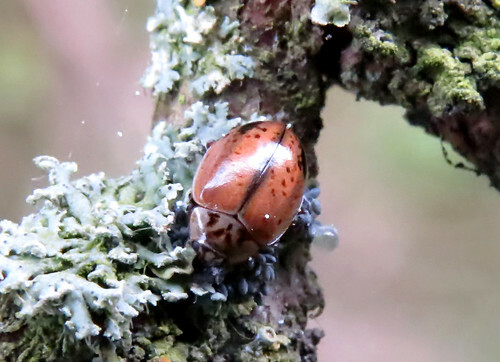 Of the scarcer Tophill species, this Larch Ladybird Aphidecta obliterate one of the few site records, while this 10-spot Ladybird Adalia 10-punctata was the latest variation of the species to be noted. 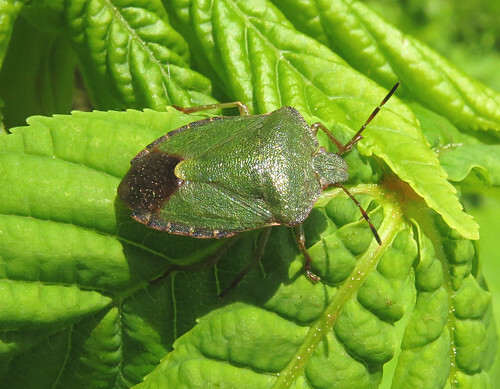 Shield bugs haven’t been particularly showy during the cold spring. This Green Shield Bug Palomena prasina one of the few seen so far but demonstrating that once the warm weather comes, everything starts to show itself.